In a ‘victory rally taken out by the TheKhasi Students’ Union(KSU) on Wednesday evening in Shillong, five people were injured. They got injured after allegedly beaten up for going wild during the victory rally to hail the Citizenship Amendment Bill lapsing in Rajya Sabha. The Superintendent of Police (City) SA Rynjah said as per the preliminary information some rallyists pelted stones and vandalized a few shops of non-tribals in Rynjah and RR colony areas drawing strong reaction from the locals, reports TNT. Five of them who sustained grave injuries, were immediately taken to the hospital, added Rynjah. The police are still conducting an inquiry into the matter and are yet to make any arrests. We have identified some of the people involved in the incident and we will take action accordingly, the SP said. The KSU activists took out a car and bike rally in Shillong city to celebrate the failure of the BJP to table the Bill in Rajya Sabha. 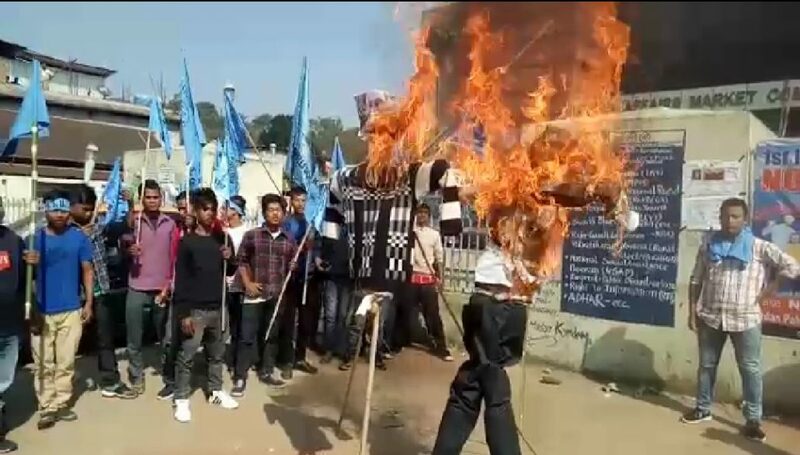 The activists also shouted slogans against the BJP and Prime Minister Narendra Modi and in the evening they burnt the effigies of Modi, Union Home Minister, Rajnath Singh at Nongpoh in Ri-Bhoi district and Nongstoiñ in West Khasi Hills district.